To view the Table of Contents in PDF format, click here. 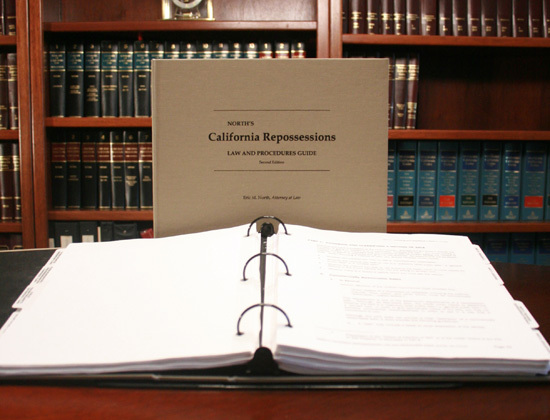 To order the California Repossessions Law and Procedures Guide, Second Edition, contact NorthLegal Training and Publications by telephone (623.537.7150) or email (rpg@culaw.com) or complete the online Order Form by clicking here. * We're sorry, but this manual is only available to consumer lending institutions, and the law firms who represent them (and, even then, at the discretion of the publisher). It is not intended for consumer use. Eric North is an attorney with the law firm of Moore, Brewer, Jones, Tyler & North, and has represented the interests of credit unions and other consumer lending institutions as an attorney since 1984. Eric is also a nationally recognized speaker on legal issues affecting consumer lending institutions. Through NorthLegal Training and Publications, working together with national, state and local trade associations, Eric presents conferences, seminars and webinars for lending professionals and for lawyers from across the country.